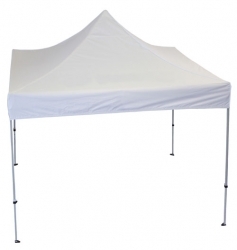 Maximum Height: 10'3" to 11'6"
Do you have any vented pop up tents? Are the bottom parts of the legs and the piece that you put the stakes in all steel, or plastic? Celina stated that the foot pads are plastic. Please let us know if you have any further questions.